» Should You Buy A Pole Saw Attachment Or A New Pole Saw? There are few gardening tools as important as a pole saw, as these devices are capable of doing so much in the modern garden. Although we understand just how useful they can be, when it comes time to upgrade or invest in one we could be wondering should I buy a pole saw attachment or do I want to get the complete package with a stand alone pole saw? Anyone who’s ever shopped for a power tool or gardening accessory before will understand the need to compare and contrast everything that’s on offer, especially if you’re someone who takes their gardening seriously. One wrong move and a bad investment can lead to hours of frustration and subpar work in the garden, so it’s essential to make the right choice from the start. If you’re yet to own a pole saw, you might be wondering what all the fuss is about and why so many people claim that this is a must-have gardening tool. A pole saw is a simple device with a chainsaw like end that attaches to a large pole, allowing the user to reach greater heights than humanly possible and all with a stable and steady hand. Pole saws are especially ideal for pruning back trees and keeping your garden tidy, but they can also be used to cut fallen branches down to size and trimming back large shrubs into whatever shape or size you see fit. When compared to a traditional chainsaw, they’re far easier to manage and will give greater results with less effort. While stand alone pole saws are definitely the most popular type, there are some that prefer to invest in a pole saw attachment for their gardening needs. A pole saw attachment is one that can attach to another power tool, usually something like a trimmer or edger, and these are purchased separately to the power base of the device. A pole saw attachment is best for those who want a lot of value from their power tools without too much of a focus on the capabilities of the actual saw, as they’re not as powerful as a stand alone. However, if you’re someone who prefers a quick once over in your garden and the option to change attachments as you need, this might be the better option. Most gardeners prefer to purchase a stand alone pole saw, simply because it’s solely been designed for one job only. A pole saw by itself features the head and power base, with the ability to extend or decrease the length of the saw. These devices are usually more expensive than just the attachment alone, so if money is and you already own a base that an attachment can join onto, this might be better. Many people will agree the pole saw on its own is better at working with a variety of trees and of varying lengths and sizes, as the entire thing has been designed just for this purpose. Another benefit of stand alone pole saws is that there are no tricky adjustments or special tools needed just to get to the pole saw to operate, which can be a bonus for some. There are certainly benefits to be found with both a pole saw and the attachment on its own, but if we had to choose an overall winner it would be the stand alone model. These might cost a little more than an attachment but there’s no need for another device or tools to get them to work, so the costs somewhat even out. Stand alone pole saws have been designed specifically for one job and they do it well, so rather than buying just an attachment that might do a subpar job then you’ll want one of these models instead. Provided you’re shopping for a quality brand and get one that is long and lightweight, you’ll be very pleased with the investment you made for your garden. Once you’ve settled on a pole saw for your garden, you’ll need to ensure that you shop around for the best one. There are so many things to consider with these gardening tools and because you’re hoping it will serve you well for many years, it’s not a decision you want to make lightly. There are so many different things to consider like will it be battery operated or are you happy to work with gas? How far will the pole saw extend and will this allow you to reach your highest tree’s branches? What is the overall weight of the pole saw and what other ergonomic features did the manufacturer include making it easier to operate? If you’ve ever bought a poor quality power tool before or invested in something for the garden that didn’t deliver what it promised, you’ll understand the disappointment that can happen. As a tool that will get so much use in your garden and provide your home with safety, beauty, and healthy trees, you need to know the answers to these questions and more. Having a good understanding of these questions and your needs will make it simple to find yourself the right pole saw so that you can make on simple investment that will serve your garden and trees for years. 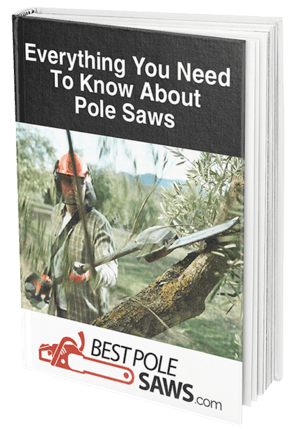 For a more comprehensive look at the best and most powerful pole saws around, check out our detailed buyer’s guide that reviews the top pole saws on the market and what you should look for when shopping around.